We've all been there: you finish a pair of socks, wait three months, weave in the ends, wait for the weather to cool off, and FINALLY wear your beautiful socks. Then, if you're like me and have made a proclamation about *not* handwashing socks (and shopped for yarn accordingly) the next step is to throw them into the "wash with like colors" laundry basket. Once the laundry is done, you go to fold the laundry and find that your vibrant, rich socks are now, well... not. Disappointment doesn't even *begin* to describe how I've felt about it, especially given my recent (and drastic) reduction of crafting time. Add to that the guilt over having enabled a few other folks into buying the same yarn. So, I Instagrammed and Facebooked about it. I did this for several reasons. Let's start with the main one- I Instagram-med, Facebook-ed, Tweeted, and talked about these socks on the podcast for about two months during the 30-odd hours it took me to knit them. Instagram and Facebook are strong enabling tools, and I have bought a lot a completely reasonable amount of yarn based on photos I've seen on both. I have been known to enable others as well, which is really only basic courtesy. I don't contact dyers privately before posting photos of my socks-in-progress, or when I finish socks. If I remember, I'll tag them in the photo, or tweet at them, because dyers are artists and like to see the fruits of their labor. 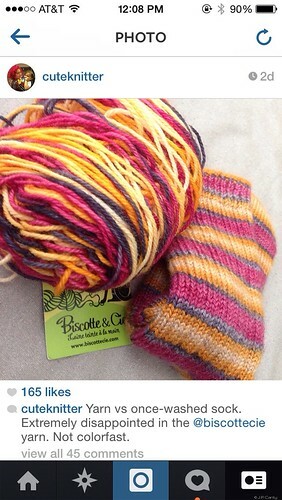 Podcast listeners frequently buy yarn they see on Facebook, Instagram, or Twitter based on what they see. It is for this reason I think it is even *more* important to show how the yarn washes and wears. I would like to start by pointing out that the label tells you that machine washing is fine. Otherwise, I wouldn't have bought it. I have been known to be extremely vocal about *not* hand washing my socks. I wrote this post when I thought that the issue was done and handled. In the interest of being honest and transparent about the entire process, I am disappointed to have to include the following. A superwash yarn should be machine washable and dryable, especially if the label says so. The re-statements above are clearly for the purpose of covering up her own short-cut, which is unprofessional and extremely poor business. There are multiple comments about others having the same issue- regardless of laundering on our facebook page as well as on the original post on Instagram (you can see all the comments on the mobile app: http://instagram.com/p/tqmW-uLZRR/?modal=true). 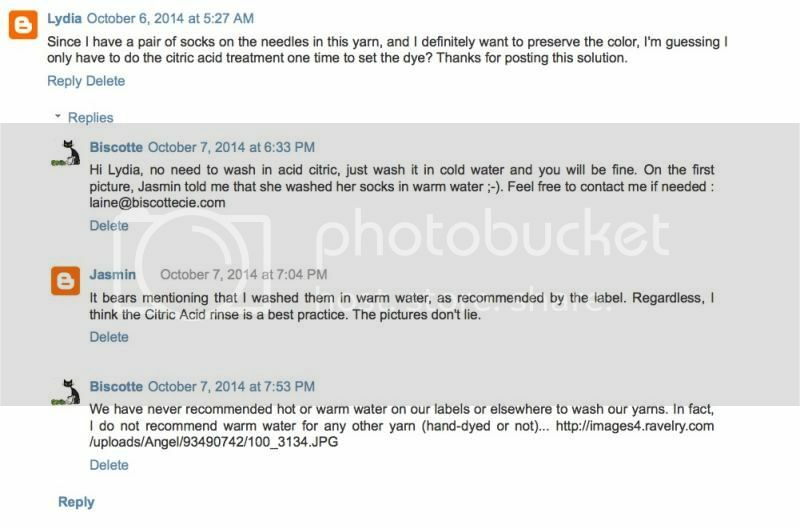 I was also contacted by other knitters via PM on Ravelry who had the same issue. The operative word there being “hopefully”. Given the response I saw on social media, “hopefully” really just isn’t. I don’t think the shop should be responsible for a dyer’s mix up, but there was no mention of letting other customers know that this is a known issue. To sum up: the dyer is trying to brush this under the rug, and has no plans to change, and the shop selling the yarn is keeping quiet as well. I am not keeping quiet. As someone who promoted this yarn for two months while I knitted this yarn, I have a responsibility to every knitter I enabled to let them know there is both an issue and a solution. Finally, as a customer I have no obligations to the company. I don't want to recommend a product that has problems. Our money and time are valuable commodities, and I can't in good conscience have my socks come out of the wash looking like they did, and leave it to the company to deal with. This is a much more transparent way of dealing with the problem, and showing the solution from the company's side. There is value in posting to social media; mostly, social solutions. I am lucky to have many brilliant friends, including the incomparable Kate of Gourmet Stash. With nothing to gain personally, she devised a solution so that people who buy beautiful handpainted yarn can solve this issue on their own, preemptively. 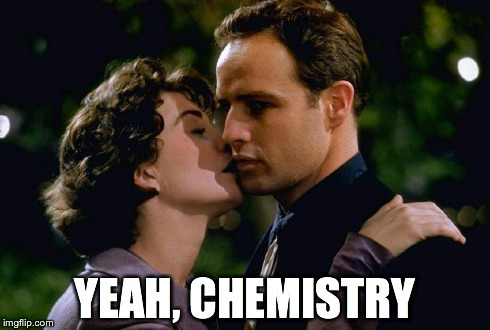 Chemistry and I have a complicated history. 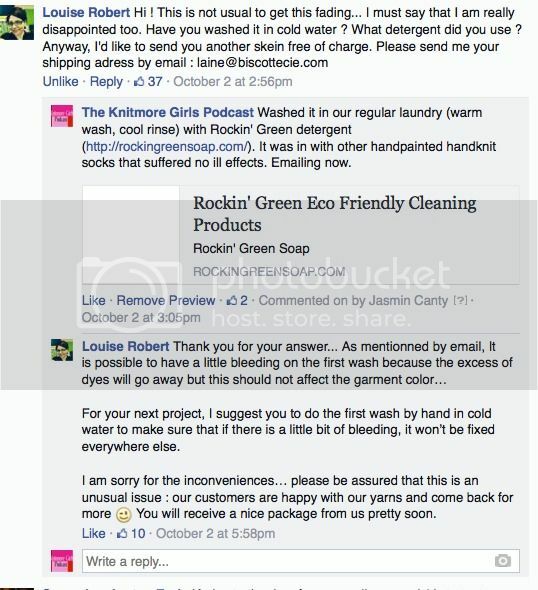 Fortunately for all of us, Kate broke it down to the simplest parts (after a lot of technical dye information). The following are her instructions (which I road tested and documented with photographs), which I have digested into four simple steps, with a few caveats. Step 1: Take 1 tsp of Citric Acid . You can buy it at Whole Foods, but the link I posted is a much better value. (For MCN, use 3/4 tsp). Dissolve it in steaming/hot water. Then, dilute it in about 3-4 cups of tepid water. Step 2b: Repeat the dyefix instructions in Step 1, *except* do 1/2 tsp Citric Acid instead of a full tsp. Step 2c: "Jelly Roll" (wrap in plastic wrap ), and microwave it for 2 mins on high. NOTE: For non-superwash yarns you would want to space out the heat via the microwave. (By that I mean, 1 minutes on heat, 1 minute off, etc. ). You can easily felt your yarn/fiber in a jelly roll format if you have the heat & steam get too high. Step 4: Launder as per usual. 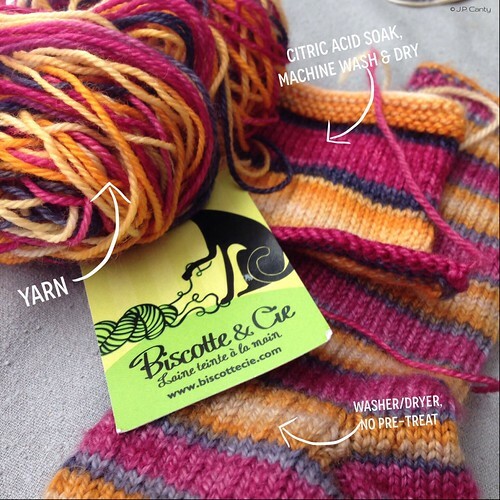 You may notice that we did the citric acid soak on the swatch instead of on the yarn. 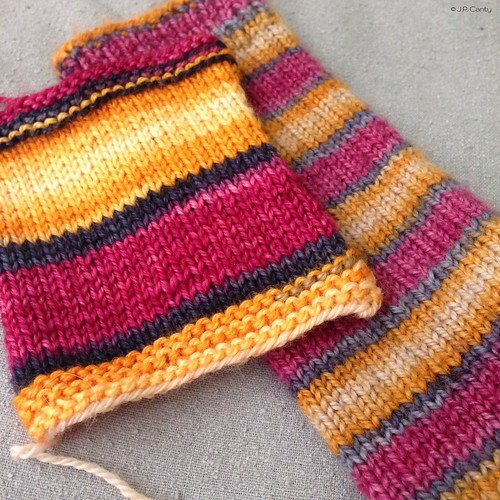 That's to show that if you've already knit your socks, you can still treat them without worry. This is also if you are overwhelmed with the need to start knitting your sock without a) fixing/re-fixing ("pre-treating") the dye on your yarn (just in case), or b) don't want to knit a swatch and launder normally to see if pre-treating is necessary. Jasmin -- great tips. Citric acid/vinegar only works on protein fiber (so animal fibers and silk). If someone is worried about a cellulose based fiber (cotton, linen, rayon) bleeding or fading, they should do the same thing, except use ~1 tsp of soda ash or something else that will make the water basic (alkaline). Glad to hear you're happy with the swatch. Agreed! My product line is all protein fibers with some nylon content here and there. I haven't dyed non-protein fabrics/yarn/fiber in eons. So my mind is always stuck in the protein dyeing world. Specifically what I was thinking in that comment, was in the spectrum of luxury protein fiber to hard wearing protein fiber I didn't see any negative of doing a simple re-setting of dye if you're noticing color bleeding/fading issues. You do need to be careful when working with luxury fibers so as to not toughen the fiber with too much citric acid. But that is another conversation for another day lol :) I will message Jasmin to make that small edit. So thanks for pointing that out and supplying additional info! HI Kate, I have just looked your Etsy shop : I love your work !! 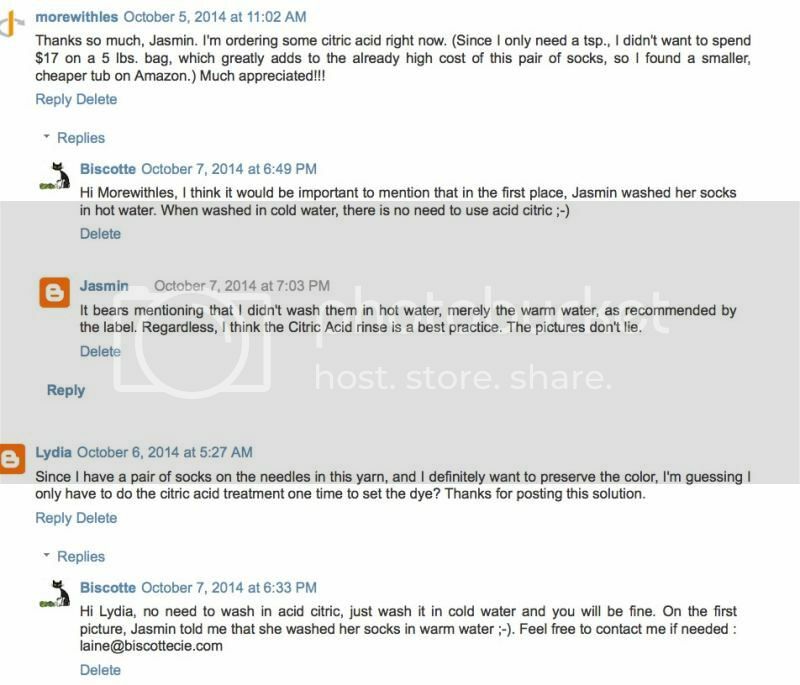 From a dyer to another : do you recommand your customers to wash your yarn/garment in warm water ? Not Kate, but another dyer. I think it's not unreasonable to expect customers to intentionally or unintentionally wash superwash yarn in warm water. Because it's superwash, I expect to be able to wash it in my regular laundry. Which in our house means warm wash, cool rinse. Once a cellulose dye has been reacted adding washing soda or any other base won't do anything. All you can do is wash out the excess dye. Fiber reactive dyes aren't like acid dyes, they react in a short time and then become inert and unable to bond to fiber. At that point excess color is simply a stain. Why don't The dyers do this before seLying he yarn? They do if they are using acid dyes. It is part of dyeing. You *must* add an acid (if not citric acid, then vinegar or ammonium sulfate) to set a dye. But you must also add heat. If that isn't done just right, the dye may not bond perfectly. Some colors, particularly reds and some blues, are apt to not want to bond easily, so there dyers and clients may run into a problem. That being said, well water, city water, whatever your water source, plus your preferred detergent, and washing machine type, will all effect how long your yarn remains vibrant. The only 100% washfast materials I know of are completely petroleum-based, man-made. Your jeans fade don't they? They do, but they're also human and make mistakes. Maybe not enough citric acid for added to the dye pot, or the ratio was a little off. Most hand dyers are artists, and they would be appalled to know that fading like this happened to their yarn. Think of this solution as insurance, because we're all human. Thanks so much, Jasmin. I'm ordering some citric acid right now. (Since I only need a tsp., I didn't want to spend $17 on a 5 lbs. bag, which greatly adds to the already high cost of this pair of socks, so I found a smaller, cheaper tub on Amazon.) Much appreciated!!! It bears mentioning that I didn't wash them in hot water, merely the warm water, as recommended by the label. Regardless, I think the Citric Acid rinse is a best practice. The pictures don't lie. Since I have a pair of socks on the needles in this yarn, and I definitely want to preserve the color, I'm guessing I only have to do the citric acid treatment one time to set the dye? Thanks for posting this solution. 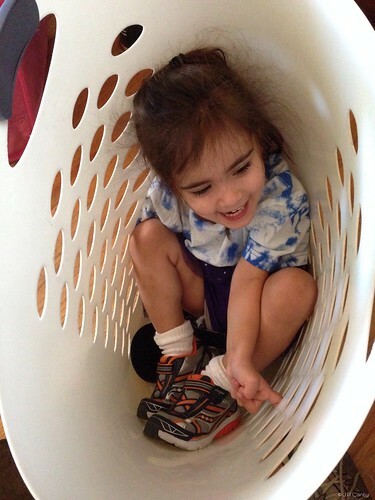 It bears mentioning that I washed them in warm water, as recommended by the label. Regardless, I think the Citric Acid rinse is a best practice. The pictures don't lie. This is great, thanks for sharing the whole process and pictures! Just a note about the plastic melting issue - I've heard (but have not verified) that name-brand plastic wrap doesn't melt in the microwave because it is higher-quality than cheaper alternatives. I've taken to buying Saran-Wrap Premium just in case, and haven't had any issues with my small-scale dye experiments so far. JessaLu, That is such a tragedy! I would be happy to re set the dye or even over dye the sweater for you. :) Just send me an email at gourmetstash@gmail.com if you are interested! Kate, you are awesome. I have been trying to stop a pair of socks from bleeding like stuck pigs and I have tried white vinegar. The socks seem as bright and vibrant as before but the dye is obviously not set right. Plymouth Yarn Neon Now in color 1 neon pink/purple in case anyone wants to know. I have washed them 3-4 times now by hand and I have to wash them alone since I am afraid it will turn my other items neon pink. I am going to try this and see how it works. Thank you for a solution. Hugs! PS. I won't make socks that will not run through the wash on warm. Cold water doesn't wash out socks well enough for me. And it won't harm a wool or silk in any way. Right? Just checking. Careful with silk- if it's heated too high you risk losing some of the shine which is what I love about silk so much anyway. Thanks so much for posting this. I was just about to work with the same exact colorway in Red Heart Super Saver and will know to set the dye first. It must be the neons that have difficulty setting. Anyway, thank you for the information. I'd hate to have my knitted kerchief colors run into my face! Faleona, RHSS is a synthetic. It doesn't get color the way protein/animal fibers do nor the way plant based fibers do. The colors in synthetics are added as a part of the creation process. The colors won't run or fade. Synthetics are plastic. Some are really nice but still plastics and yes I use plastics as a generalization. I know there is a different term but it's too late at night for me to think chemistry. Hi Everyone ! I am glad to say to those who took advantage of our free skein offer that we have prepared a special self-striping colourway for this event and the yarn has been shipped earlier today. Thank you for being so many to answer and show your interest in our hand-dyed yarns. Feel free to contact me anytime if you have questions or comments. I totally agree with you that the yarnie's response to this was not very good :-/ She should be setting her dye better, for sure. That said, I definitely recommend washing almost ALL laundry in cold water instead of warm or hot- it's much easier on the dyes, on the fibers, and on your electric bill! The only things I ever wash on hot are gross towels and dishrags. Cold water also tends not to "set" stains like heat can sometimes do (though once it goes in the dryer, that point is moot anyway.) I usually lay my handknits out to dry unless they are the sort of superwash that grows and needs some dryer time to pop back into shape - it keeps them from pilling as quickly. 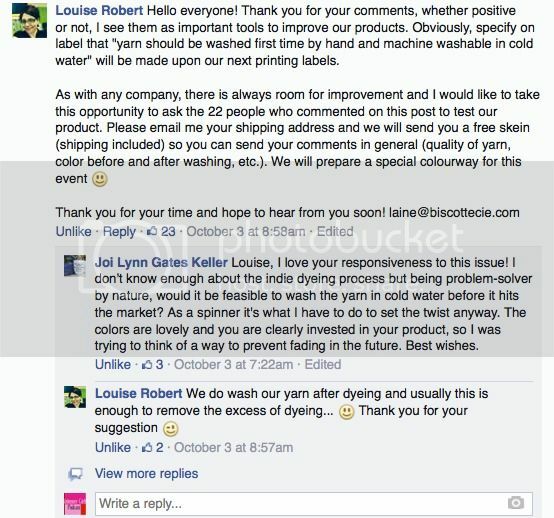 We were very disappointed to read the outcome of recent events about our new yarn colourway. Our intention was never to create a affiliation with Knitmore Girl, however, we thought Jasmine and her fans would be pleased with this colour. We are a small family company : I am the mother of three children aged 10, 12 and 14 years and we are working hard to manage our local yarn shop and make known our hand-dyed yarns to the web community. That's why we had the idea of creating a color to honor the Jasmin’s Podcast and we sent over than fifty skeins, free of charge and shipping, to Masmin readers and listeners. We apologize publicly for this confusion : the goal has never been to affiliate our yarns to Knitmore Girl podcast. All photos of the pink and gray self-strping yarn will be removed by the end of the day. I don't have a microwave. Is there a temperature the citric acid solution needs to reach? Why Citric Acid instead of vinegar? I had to wash in cold water and does not bring good results.Maybe I will try with Citric Acid.